Lottery Games Can�t Help You to Purchase a Dream by http://www.canadafaq.ca/. Many people play lottery games, despite the fact that lottery is a form of regressive taxation. It is a type of an escapist game that fuels imagination. You start making plans about the things you will buy with money you don't have. And everything that comes to your mind is prohibitively expensive stuff. Of course, you deserve top-notch designer clothes and a fancy car. You can buy a lot of stuff, and it is just a lottery ticket away. But what are your chances of hitting the jackpot? 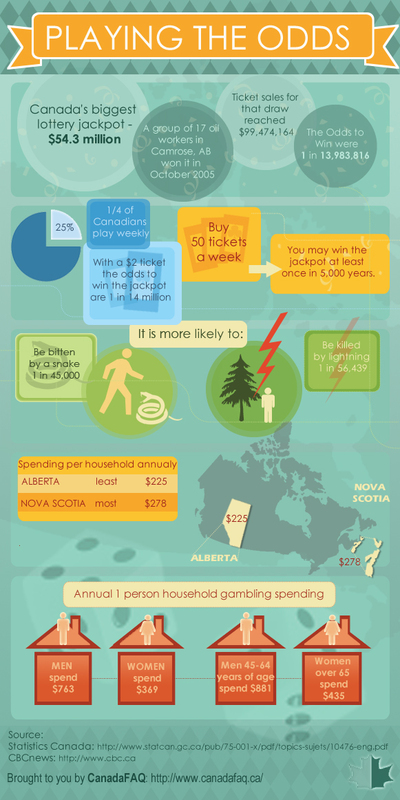 It is more likely to be bitten by a snake than to win the lottery, this infographic shows. Yet, many Canadians keep playing and one in four plays weekly. It is mostly low-income people that play games of chance. This is not surprising given that the payout rate and the size of the cash prize have grown. Lottery advertising campaigns encourage people to buy tickets. Slogans such as 'Dream Big. Win Big' and 'Live a Lotto Life' sound familiar. They make lottery gambling sound like a lot of fun and encourage people to buy tickets. And the working poor spend a lot of money on tickets to escape poverty. People buy tickets because they believe that everyone has a chance to win the lottery. A study published in the Journal of Behavioral Decision Making confirms this. The participants in the study were divided into two groups. The first group was told that everyone has a chance to win, regardless of their housing situation, job, and educational level. Participants from this group purchased 1.31 tickets on average. In comparison, the second group bought 0.54 lottery tickets. People believe that they are not simply buying a lottery ticket - it is a way to purchase a dream. Lottery winnings will make them rich. They will be free to choose whether to work or not, how to treat their boss, and how to invest or spend their money. People think that lottery money will give them more time to spend with their friends and family. They will be free to travel, dedicate time to their hobbies, and so on. Many people purchase lottery tickets to buy their way out of poverty or their mundane routine. And many Canadians spend a lot of money on tickets. Men spend $763 on tickets a year and women spend $369 on average. Men aged 45 - 64 spend even more or about $881 a year. At the same time, the chance of hitting the jackpot is 1 in 14 million. There are different ways to complement and increase your salaried income, including different saving and investment instruments. Lottery gambling may be fun, but it is least likely to make you a rich person. Even if you hit the jackpot, there are many examples of people who became lottery millionaires and then went bankrupt. People who lack financial literacy often end up losing money, whether they work 2 jobs or won the big prize.